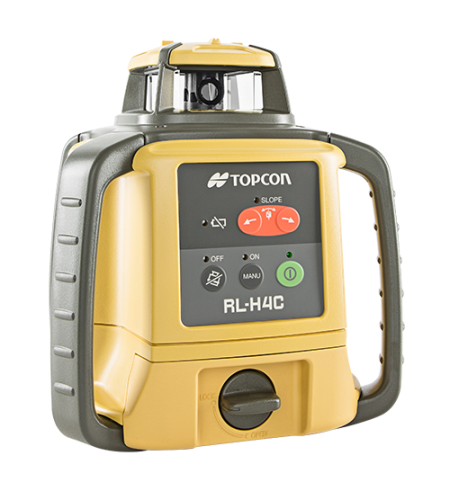 The RL-H4C provides horizontal accuracy of ±10 arc-seconds (±1.5mm@30m, ±1/16in. @100ft.) across the 800m (2,620ft.) area in diameter. This is the widest working range in its class. General construction projects - grading, excavating, concrete work for foundation and footing, and other exterior works - are perfect applications for the RL-H4C. Slope matching feature allows for easy grade setting using two arrow buttons. Simply press a button to start tilting the laser, and press it once again when the sensor receives laser on grade. Unlike the pendulum compensators, Topcon's electronic self-leveling mechanism provides a more stable laser even at job sites subject to vibration. If the RL-H4C is jarred or tilted while rotating, its HI Alert system warns the operator by three flashing LED and a sensor's icon to prevent false readings. New laser sensor LS-80L offers increased working range* even with other Topcon rotating lasers. It indicates the laser beam position with two LCDs on both sides plus audible tone. The LCD icons also notify the HI Alert and Low Battery warnings of the RL-H4C laser. * Approximately 20 percent increase. space for storage and transportation. Level sensor x 2 ea. Sensor holder 6 x 2 ea. D/LR20 battery x 4 ea. AA/LR6 battery x 11 ea. BT-74Q Ni-MH battery pack x 1 ea. AD-15AC/DC converter x 1 ea. LS-B10(W) MC laser receiver x 1 ea. Durability and long life of Topcon lasers are ensured through extensive testing under extreme conditions. Environmental tests for the RL-H4C include temperature, humidity, vibration, shock, drop, dustproof, and waterproof, making it the most rugged and reliable rotating laser.